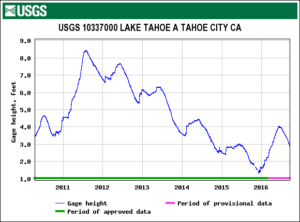 Are you wondering what has happened to Lake Tahoe’s water level this summer? According to gauge data from the US Geological Survey, the lake water level peaked in early June, at just over 6,224′ a little over a foot above its natural rim of 6,223′ above sea level. The insert graph’s “zero” is 6,220′, the and it shows that the water level is now down to just about an inch under the natural rim, as of September 18. This doesn’t seem too bad, considering it has only rained twice since May! 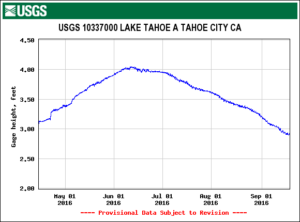 The fact that the ‘Jewel of the Sierra’ was above its natural level from early April 2016 to just a few days ago is an improvement over the previous year, when it had only reached 6,223′ for five days in June of 2015 before dropping below again. The regulation of water level in Tahoe began in 1874, and since then the highest level was 6,231′ in 1907, and the lowest was 6,220′ in 1992. It will not surprise most of you that the maximum rate of outflow from the lake was recorded on January 2, 1997, when much of northern California experienced severe flooding. For some perspective, see the next graph which shows historic water level from April 2010 to September 2016.